Sheffield rock band Arctic Monkeys have declared they will not perform at Glastonbury Festival, in any capacity, until they have completed a new record. "We wouldn't want to blow it," bassist Nick O'Malley told BBC 6 Music. "We'd rather come back after we'd done an album and do it properly." The group plan to start their fourth record soon, and said they hope to work with rock heavyweight Josh Homme again. 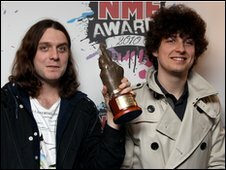 The Sheffield quartet picked up best live act at Wednesday's NME Awards. They play London's Royal Albert Hall on 27 March as part of Roger Daltrey's Teenage Cancer Trust charity series. Then, throughout April, they will be on the road in America. But drummer Matt Helders described the band's diary as follows: "Detox. Then America, and then after that I think we're quite eager to record some more." When we're ready to record again, he [Josh Homme] might be as well. "It's exciting to be in the studio," he said. "We had a lot of fun last time, so it's kinda the bit that we enjoy the most. "Obviously going on tour is a lot of fun and amazing, so I wouldn't have one without the other, but I think at the moment we're quite ready to get back into it." Queens of the Stone Age and Them Crooked Vultures frontman Josh Homme was behind the desk during recording sessions for Humbug, which was released last August. When asked if it was the first and only time they would work with the rock superstar, Helders laughingly replied: "I don't know. He might be a repeat offender. "He promised he'd call, but he's a busy man. We had a great time. We'd love to work with him again in some capacity. It depends. "When we're ready to record again, he might be as well, but you know what he's like, he's a very busy man and in demand." Homme ushered in a darker, more experimental sound for the band, who remain best known for hits like I Bet You Look Good On The Dance Floor. Asked about the sound of their next record, O'Malley said: "We've been talking about a few ideas, like doing it really fast. Who knows? Definitely the wings are aloft, so who knows?"